Imagine this. Is this our future? Instantly the home virtual assistant comes to life and repeats back in an eerily human voice. “Yeah,” grunts the man as he dials in a new show on his remote and pours the remaining crumbs of the potato chip bag into his mouth. Quickly the AI assistant calls the local pizza parlor and a friendly “employee” answers. “Hi, I’d like to place an order for a large pepperoni pizza and a liter of soda for delivery,” requests Bob’s AI assistant in a cheerful and pleasant demeanor. “Not this time. Just the pizza and soda will be fine,” replied Bob’s assistant. “Yes. Thank you!” replied the AI helper. Speedy Pizza’s “employee,” also an AI human voice interface ordering system confirms the order. Immediately the order is transmitted to the PizzaBot 3000 which is packed full of ingredients. The circular pizza moves along a belt, sauce is spread, cheese is sprinkled and pepperoni slices rain down with precision. The conveyor transports the pie into a fast bake oven and directly into the box 10 minutes later. A buzzer rings indicating to the lone human on staff that it’s time for the pizza to be loaded into the self-driving electric delivery vehicle. This too is a no-hands affair as the human is there only to ensure no mechanical breakdowns. The piping hot pie slides down a loading ramp and into the insulated pizza bag in the front seat. The transport bot, neatly clad in Speedy Pizza garb and strikingly human in appearance, waves to the supervising human as it zips away into the night. As Bob’s stomach continues to growl, the cheesy goodness makes its way to his apartment in a self-driving delivery vehicle. He receives a text that the pizza is out front ready to shovel into his mouth. He grumpily gets up, dusting off the day’s snack remnants and opens the door to be greeted by the transport bot. “Good evening sir. Your order has arrived,” states the android. 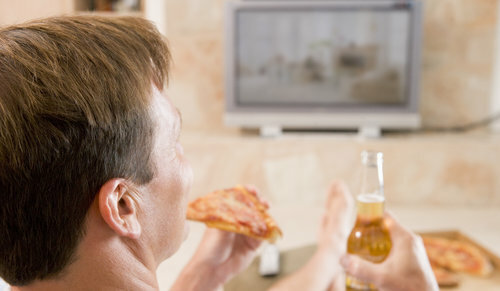 Bob grunts a notion of approval as he hurriedly slides the pizza and soda into his arms and sets off back to his recliner, shutting the door with his foot.